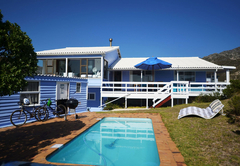 The Mermaid's Tail is a highly recommended property providing self catering in Pringle Bay for up to 8 guests visiting the Cape Overberg region. 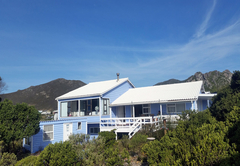 The Mermaid's Tail is a glorious three bedroom self catering holiday home in Pringle Bay. 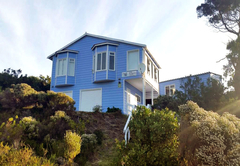 This is the ideal spot for a family beach holiday; while here you can go fishing, surfing, mountain biking or simply laze in the sun on the beach, which is a mere 10 minute stroll from the house. 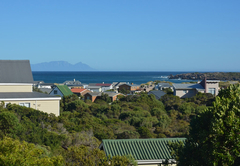 There are a number of shops and restaurants in the main shopping centre and many attraction and activities for your enjoyment in Pringle Bay and the nearby surrounding areas. 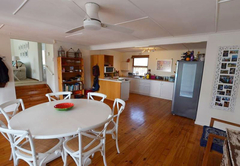 The house is fully furnished and has three bedrooms and a sunroom off the lounge, which is separated from the lounge with sliding doors and curtains for privacy. 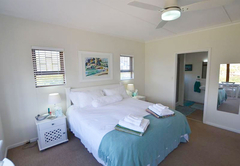 The main bedroom has a queen size bed with a king size duvet and an en-suite shower and toilet. 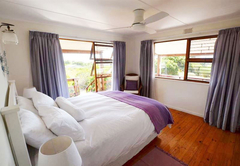 The second bedroom has a queen size bed with a king size duvet and separate access to a family bathroom with a bath, shower and toilet. 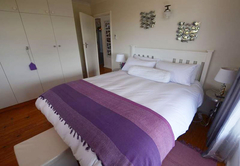 The third bedroom has two single beds with ¾ duvets (two of the beds can be placed together to form a king size bed with an extra 'memory foam' mattress topping to cover the gap between the beds) and a separate en-suite shower and toilet. 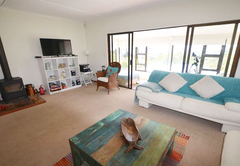 The sun room is situated off the lounge and offers a double bed, and for children there is an extra pull-out “futon” bed and a daybed sofa. 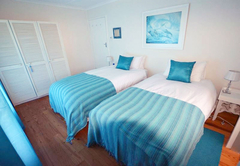 There is also a comfortable double sofa bed in the lounge for overflow accommodation. The lounge has a TV with DStv, a CD / DVD player, a mini Hi-Fi and Wi-Fi. 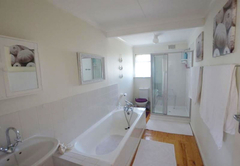 White bath towels and striped swimming towels are provided. 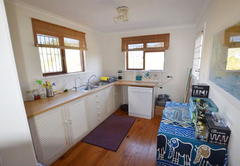 The kitchen is fully equipped with cutlery, crockery, stove, microwave, fridge, kettle, toaster, cooking utensils (including high quality waterless stainless steel pots), basic spices, sauces, coffee, tea, long life milk and sugar. 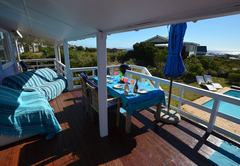 Outside you can enjoy relaxing on the deck or dining alfresco. 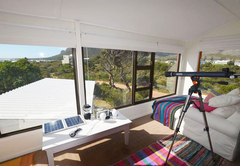 There is a wood burning heater and a weber braai / barbeque plus a gas braai for your use. 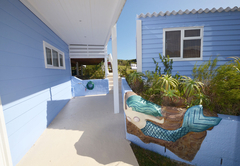 There is a chlorinated salt water pool, as well as a number of pool toys, arm bands and other beach games and toys available for your use, including 7 adult mountain bikes and 3 kids bikes. There is also a ‘foosball” soccer table, mini table tennis table and a dart board in the garage. 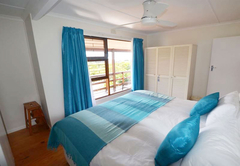 This lovely house has three bedrooms, of which two have en-suite bathrooms. 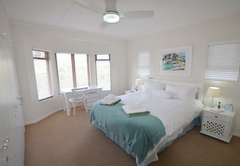 There is also a sun room with an additional 2 single beds. 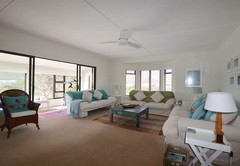 The living space has a lounge, a dining area and a well-equipped kitchen. There an outside deck, swimming pool & garden. 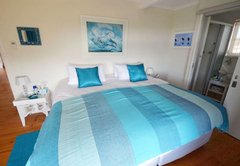 Had a lovely stay at Mermaid's Tail. 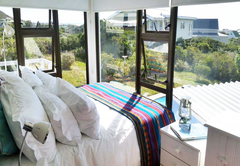 The accommodation provided had everything you needed and more! The attention to details was fantastic and made us feel very welcome! Will definitely stay there again in future. Response timeThe Mermaid's Tail typically responds to requests in 5-10 minutes. Child policyChildren of all ages are welcome but please note there is a pool (which is covered with a net).